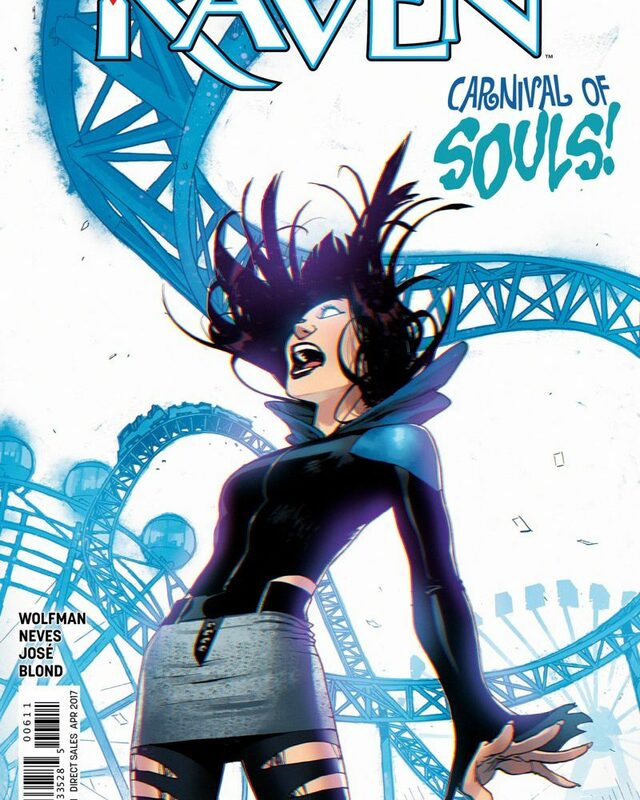 We now have the sixth and final issue in Raven’s Rebirth series – The White Carnival. Our heroine is at her lowest point and the White Orb has accepted her into it’s World. As Raven wanders through the Carnival of horrors, she reaches out to all its victims. Her voice does not reach them, but when Raven sees a familiar face, will she be able to save those closest to her? Willing to sacrifice her life, can Raven find the strength to defeat this still unknown entity? I have held out hope for the last five issues, but I am left bitterly disappointed by this series. This Rebirth project was to explore Raven’s journey of getting to know her human half, including her mother’s side of the family. This had lead her to San Francisco and the family of her Aunt Alice. By not releasing any information about her true identity as Raven, a key member of the Teen Titans, she quietly settled into their family life and started to attend High School. However even while acting as a typical transfer student, Raven – otherwise known to others as Rachel, still managed to get pulled into some form of intergalactic trouble. With an enemy only known as the White Orb, a spiritual being capable of mind control, there was never really a good explanation given as to what it was. Although we did get to see Raven go through some interesting moments, like attending high school. She did make some friends there, even if she had only just been there a week. As to if those friendships will last is unknown, but I wouldn’t hold my breath. Because of those students that she met, she formed a kind of bond with them. Ultimately caring for each of their well beings and subsequently risking her life for theirs. Then again, Raven is a Teen Titan and it comes with the territory. She began to explore her feelings and get in touch with her biological family. Being the daughter of a demon king however, she always risks the danger of her emotions overwhelming her and thus releasing her father from his dimensional prison. She continues to explore her heritage but will always have to restrain from fully expressing her feelings. Raven has not been strong enough at any time to defeat this enemy. It is only when her Aunt Alice approaches her, that a plan of action is formed. However it does not come from Raven. Her Aunt Alice is a true Christian and puts all her faith in her God. She extends her hand and strength towards Raven and asks all those around her to do the same. This subsequently gives Raven a new form of strength, a connection that fights against the Orbs tactic of erasing one’s memory upon contact. An action that was repeated a few times within the issue, which served as quite an annoyance whilst reading. Feeling very un-original and distracting, as if those panels used could have been put to better use. Even in the end of the series, we still never were given a direct explanation as to what the enemy was. The way in which it was defeated also felt like I was cheated after spending all this time reading the series. It was like a scapegoat solution, a way of tying up the series swiftly. Perhaps the White Orb will be revisited again in the Teen Titans comics. The Cover Art pictured above is by an artist known as Bengal. 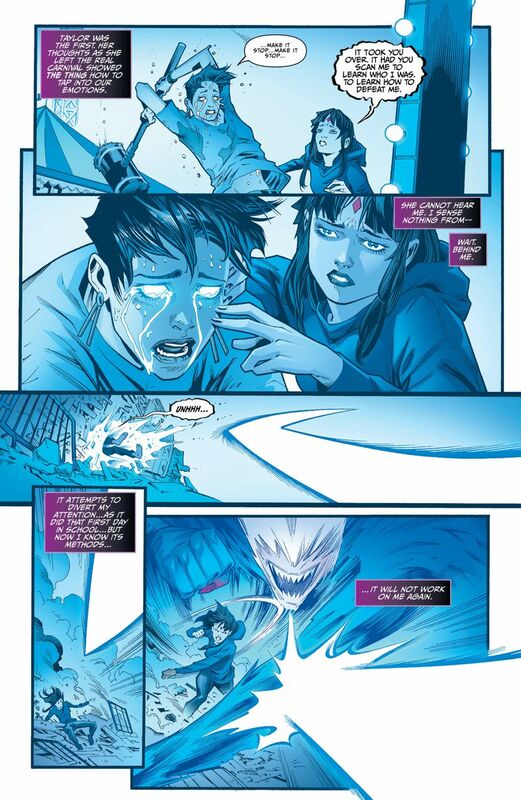 He has previously supplied covers for a number of Teen Titan issues, as well as illustrating the Batgirl: Endgame #1 & Adventures of Supergirl #1. 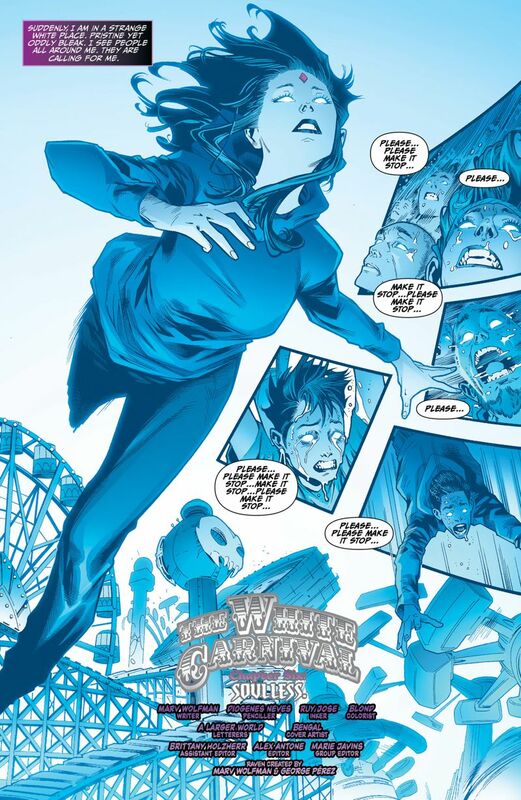 This cover shows Raven within the White Orb, whilst either using her powers or beginning to be controlled by the enemy. A nice illustration that would be eye catching on the shelves. Inside the art is by Ruy Jose and Diogenes Neves. Jose & Neves have been working on the series since Issue 4, after taking over from Alisson Borges. Together their work has been impressive, they have really given a definitive design to Raven that I am pleased to see. Their character designs and facial features are skillful. Although I despise the sheer sight of white borders and unused space, it was beneficial whilst the scenes took place in the White Orb. I can not fault the artwork, the script however is a different issue. I feel the storyline was never fully explored, the enemy was a joke. The execution of this glowing orb was a rip off, thankfully however it was only a mini series. We did get some solid character developments for Raven, but that is it. The action was just disappointing, all this coming from Ravens creator Marv Wolfman. If you have already bought the first five issues, I’d advise buying the last, just so you can see how it ends.